After weeks of knowing absolutely nothing, trapped in the quicksand of speculation, staring quizzically at guys like Koa Ka’ai on crutches, we now know something concrete — red shirt freshman Marcus Mariota will be under center when the always-scary Arkansas State Red Wolves travel to Autzen on Sept. 1. The seven-month QB battle was declared finished by the Oregonian this morning, then later confirmed by the team’s official twitter account. What this means for Bryan Bennett, the third-year sophomore who shined in limited time last season, is unclear. 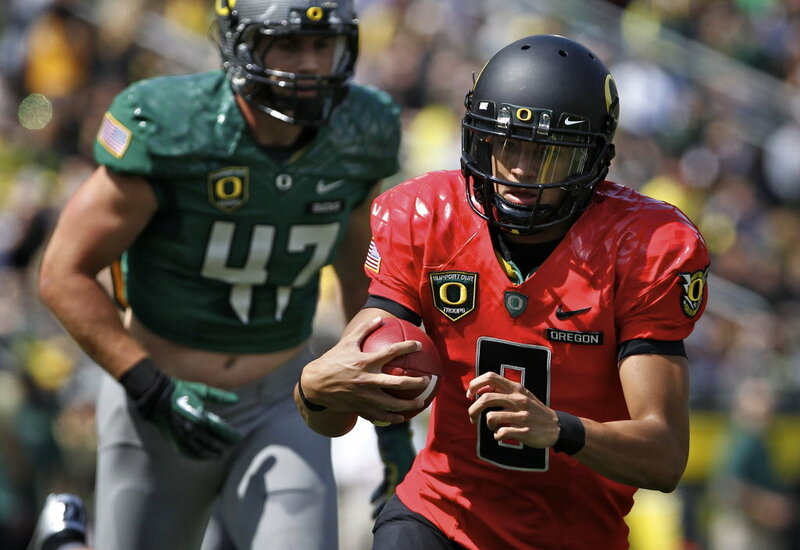 Bennett was the favorite to win the starting job prior to the spring game, but during that game, Mariota played like his last name was Vick, and the tables turned dramatically. It appears that Bennett couldn’t recover from the initial hit. More to come. ‹ Hey, aren’t you number 25? !